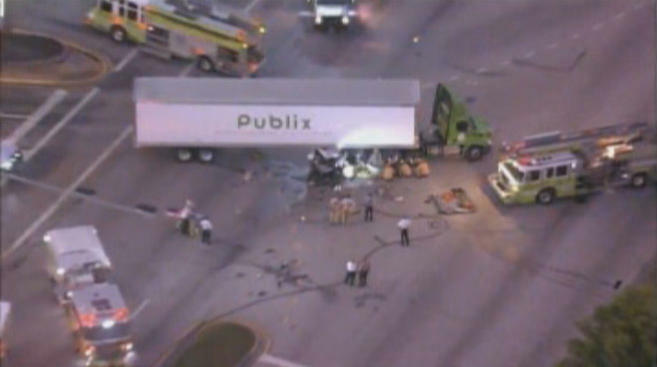 A major auto crash involving a Publix truck and a passenger vehicle killed one person this morning. The driver of the passenger vehicle was pronounced dead at the scene, while the passenger in the car was rushed to the hospital. When suing for just compensation in such cases, it is recommended that families choose a Board Certified attorney. A major truck crash in Miami killed one person earlier today, and stopped traffic in both directions in a section of US 1. The crash, which occurred in Southwest Miami-Dade, occurred just before 5:00 a.m. when a Publix truck collided with a passenger car. The crash took place near Southwest 146th Street in Palmetto Bay, and according to published reports the tractor trailer crushed the passenger car underneath it. After furiously working to extricate the driver of the passenger vehicle from the wreckage, first responders pronounced the driver dead at the scene. The passenger in the vehicle was rescued from the car and rushed to Jackson South Trauma Center in unknown condition. The driver of the tractor trailer was reportedly not hurt in the crash. In major auto crashes involving serious injury and death, it is common for the families of the survivors to incur significant costs and losses associated with the injuries and deaths of their loved ones. Families may have to cover medical and funeral expenses, as well as suffer the loss of any wages their loved ones would have earned, and any lost companionships (consortium) as well. When choosing a lawyer to file suit and recover damages, it is important to select a Board Certified attorney in order to have the best chance at receiving maximum recovery. Especially at it relates to crashes involving company vehicles, choosing the right counsel is paramount. Corporations have been known to fight personal injury and wrongful death lawsuits, even when they are at fault. For this reason, the choice of legal representation for the victim’s family could mean the difference between securing a proper settlement, and possibly failing to secure a settlement altogether.